A recent news report in Thailand has revealed that Thai netizens do not believe official government statistics regarding the actual number of tourist arrivals to the country. Several readers of a popular local news portal wrote similar comments in response to a statement made by the Sports and Tourism Minister. Some even made snide remarks attempting to point out just how ludicrous the statement was. In the initial news report, Sports and Tourism Minister Weerasak Kowsurat claimed that since the government introduced its visa-on-arrival fee waiver (for 21 countries), the number of tourist arrivals had surged by 20 percent. He said in his quotes that the ‘bounce’ came mostly from Chinese and Indian tourists. A netizen whom the report only revealed as YC claimed that a surge of as much as 20 percent did not make sense. “Tourist numbers recovered, all because they got to save 2,000 baht (US$70)? Hmmmkay,” he wrote. “I am not sure how they arrive at these figures, when other areas are reporting downturns (well, actual Thais on the street and in the shops are). However, even if true, I ask myself what kind of quality tourist are they encouraging to come here and spend (!?!) if the decision to come or not is based on whether they can save 2,000 baht!?!? (That implies to me that they are on a budget big time? ),” another netizen remarked. Thailand’s tourism sector has come under the spotlight following a sharp drop in the number of people visiting the country. Official statistics in August indicated that travellers from China slid 12 percent, the biggest drop in more than a year, keeping the overall pace of visitor growth near a 16-month low. Perhaps one of the biggest reasons for the drop was a tour boat accident off Phuket in July that killed 46 of the 101 passengers on board including 86 tourists. All but two of the tourists were from China. Then, in late September, a video went viral of an airport guard apparently punching a Chinese tourist at Bangkok's Don Mueang airport. Sunsern Kaewkumnerd, a spokesman for the government, was reported as saying that Prime Minister Prayut Chan-o-cha was "upset" by the incident. "The prime minister thought that even though the tourist could not produce documents to reaffirm his accommodation in Thailand, refused to stay in a detention room, and acted inappropriately with officials, still officials must compose themselves and treat him in line with international practice," Sunsern said in a message to the media. The drop in tourism is especially distressing to Thailand considering how large its contribution is to the country’s economy. According to the Tourism and Sports Ministry, tourism contributed 17.7 percent to Thailand’s gross domestic product (GDP) in 2016 and 16.7 percent in 2015. The World Travel and Tourism Council says tourism accounted for 10.4 percent of global GDP and 313 million jobs, or 9.9 percent of total employment in 2017. 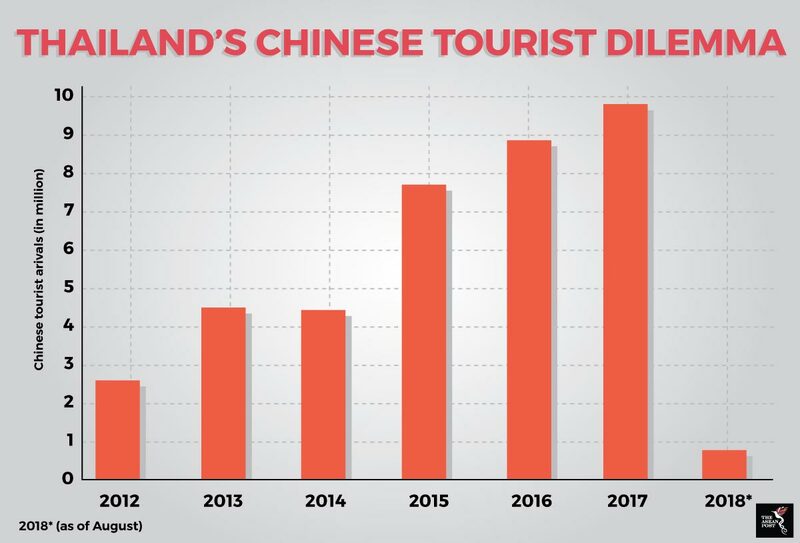 What is more distressing is the fact that the biggest contributor to Thailand’s tourism has consistently been Chinese tourists. This has been the case since 2012 up to 2017. In 2012, there were 2.7 million tourist arrivals, 4.6 million in 2013 and 2014, 7.9 million in 2015, 8.7 million in 2016, and 9.8 million in 2017. Thailand is slated to have its first election in a long time on 28 February next year. That’s mere months away. However, being unable to address the perception that tourism in Thailand is still facing serious problems could influence the outcome of the election. “What holds the economic voting theory together is the notion that voters pick candidates on the basis of their economic influence. In particular, incumbents who have presided over economic prosperity are rewarded at the polls, while those who are deemed responsible for decline are punished,” they explained. They also go on to point out that while economic voting may have first been observed in the United States (US), new literature has also been observed in established as well as in many emerging democracies. If the economic voting theory holds water in Thailand then it would be wise for the government there to do all it can to address perceptions that the tourism sector in the country is suffering. That is, if it wishes to remain in power after the next election. As mentioned, coming out with statements is just not good enough while the clock keeps ticking. If the government does not address this quickly and carefully, it may well see itself being replaced come February.